It took a radio host to advise listeners that March 6, 1912 was when Oreo cookies were introduced to the world. The original Oreo creator would be surprised at the Oreo options that exist today. It reminded me of a recent visit with our older grandchildren, where our preteen granddaughter wanted to experiment with a concoction she had heard about – layering chocolate chip cookie dough, double stuffed Oreos and brownie batter. She wanted to bring it in to her school to celebrate her half birthday. Of course, she found a recipe very quickly. We can find anything on the internet. The recipe that she found is called “Slutty Brownies.” Fortunately, she did not ask me what that meant. Although the website says that the recipe is easy to make, it seemed like too much work. Take a look at the recipe. Instead, when we went shopping for the ingredients, we found Ghirardelli chocolate triple fudge premium brownie mix with fudge and chocolate chips. We decided to use the mix instead of making the brownie batter from scratch in the recipe. It was the best move. The recipe called for an 8″ x 8″ pan. We used a disposable 9″ x 13″ pan and it was fine. My daughter made it again with our granddaughter in an 8″ x 8″ pan and found it took longer to bake. We both lined the pan with aluminum foil as the recipe called for, for easy removal from the pan. We found that we had to bake the concoction longer than the on line recipe called for. I think it was because our granddaughter preferred double stuffed Oreos and the brownie mix was a larger amount than the brownie recipe. We followed the section of the recipe for chocolate chip cookie dough exactly, but used only organic ingredients. “Preheat oven to 350°F/180°C. Line a 9×9-inch (or 8×8-inch) baking pan with tin foil, leaving enough overhang on the sides for lifting the brownies out after baking. In a mixer bowl, beat butter, brown sugar, and granulated sugar on medium speed until light and fluffy, 3-4 minutes. Beat in egg and vanilla. Add flour mixture and mix just until combined. Do not overmix. Fold in chocolate chips. This is where we deviated from the recipe for ease and just plain triple chocolate overload. What can be better than a layer of Ghirardelli chocolate triple fudge premium brownie mix with fudge and chocolate chips! We followed the box instructions, which were so easy. We allowed the cookie dough to cool for 15 minutes, then made a single layer of double stuffed Oreos, and finally poured the brownie mix over them. We ended up baking the concoction for close to 45 minutes rather than the 20-25 minutes in the recipe. For the smaller pan with thicker concoction, my daughter said she baked it for an hour. It felt like forever before the toothpick came out somewhat clean. The hardest part was seeing and smelling this amazing layered delight, and not touching it for the recommended four hours in the refrigerator to cool for easy cutting. We never got to four hours or to the cutting part. Our fifteen year old grandson, our twelve year old granddaughter and I each took a fork and dug in. This is one of the most delicious and decadent desserts I have ever tasted, and I am far from fifteen or twelve, and have tasted many delicious and decadent desserts in my time. We proceeded to eat much more than we should have. The recipe says it will last for up to three days in the refrigerator. We challenge you not to eat it all in one sitting or one day, which is what it took us to finish the entire pan. Now, here is the bad news for us Boomer grandmas. The recipe my granddaughter found did not include calorie count. I tried to find the calorie count by putting “calories in layered oreos, brownies and cookie dough” into Google. We all think we are original. 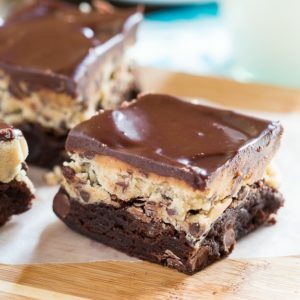 I actually found a 2015 recipe for “cookie dough brownies” in which the baker used Ghirardelli brownie mix! She did not say she used Ghirardelli chocolate triple fudge premium brownie mix with fudge and chocolate chips! The more chocolate the better! That one square is not 450 calories, as one cannot eat just one square. You will have the most fun with your grandchildren who cannot believe three beloved desserts are baked into one cookie dough oreo brownie.